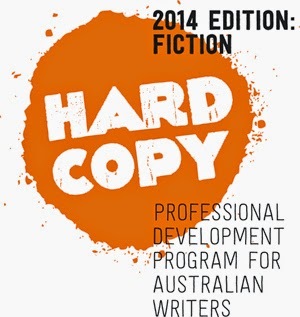 Over the last couple of months I've been part of the Hardcopy Professional Development program for writers offered by the ACT Writers Centre. The format broke into two long weekends - editorial and Intro2Industry. The latter wrapped up on Sunday after three intense and well-programmed days that brought agents, experts and literary shaman to the ACT. Okay so there were no actual shaman but the list of svengalis was impressive. Probably the best part was the range: from traditional dead tree publishers to the digital experimentation of IF: Book Australia. Over the entire program opinions varied (fiction books, apparently, must be at least 70,000 words, 60,000 words, okay 50k but that's really as low as publishers will go - unless it's a digital book) but there were a lot of great insights. So the book has been dying for years right? But stats from Penguin/Random House point to print sales slowly declining but time spent online increasing. No big surprise, but these offline and online readers are the same people. Readers are changing where and what they read, but they're not becoming extinct. Speculative fiction has seen word counts exploding (blame Harry Potter, Game of Thrones and even Fifty Shades of Blah, the latter was of course spawned from online fan fic). Fan fic may be the way of the future but the only Amazon is jumping onboard with Kindle Worlds. This experiment bizarrely offers the chance to publish GI Joe fan fic right beside re-imaginings of Kurt Vonnegut's work. Some publishers even went so far as to say they were optimistic about telling Australian stories regardless of the medium. Simon Groth from IF: Book redefines the book to be an artefact that asserts "the primacy of text" which opens it up to even more possibility. There was a big push from publishers, agents and writers to get onto social media. This triggered the debate that in all of this tweeting, blogging and twitchily checking your Klout score, writers find it hard to find the time to actually write. The only cure is a digital detox. Eva Bui, Digital Marketing Manager at Random House Australia stressed the importance of authors having strong online identities and publishers being able to amplify this - but they have to have something to plug their amplification into. She gave a great basic content marketing mix of: editorial, create + curate, distribute, entertain and collaborate, which works in a different ratio for every writer/organisation. It gave me a personal kick in the pants to blog again more regularly. If you're going to be a writer you need to be a reader first. This one is the original chestnut from the chestnut tree planted by Vic Chestnutt, but we all forget to actually go out and read outside our comfort zone. One of the sideline events was a launch of The N00bz, a book that pushes writers to do something uncomfortable like create a comic book or use a typewriter instead. Every writer who spoke emphasised the importance of reading outside of what they normally do. There were tales of writers wandering from their bread and butter genre and finding a new love (and sometimes a new audience). There was a lot brilliant points made about rights and contracts - read the fine print and look very closely at when rights will revert to you because digital means out of print can mean never. Alex Adsett had great advice here for when you get a publisher contract or an agent deal. But also the IF:Book concept of the amplified author suggests that authors need to let go to explore different models. By looking at their relationship with publishers and distributors, they can find the right mix between capital, investment (personal as much as dollars) and control. The poster boy for this was Scott Sigler who works with publishers but gives away free eBooks and podcasts of his books to build his fans. So there were a lot of great brains in the room, but it all came back to creating a good manuscript. Writer/editor Irma Gold talked candidly about working on both sides of the fence with the idea that a relationship where an author accepts all editorial advice is unhealthy - for the book and the writer. Agent Sophie Hamley agreed, empowering writers by saying: "You are the storyteller and only you have the expertise to see where the story goes." Also Jenni Curry, writer and fellow Hardcopier, has blogged on day two and there was a very busy hashtag. Thanks to ACT Writer's Centre for organising an inspiring and impressive session, particularly Nigel Featherstone and Director Kelli-anne Moore without whom none of this would have happened.